Snowmobile racers leap over a jump during a race as part of the East Coast Snocross at Bass Park in Bangor, Jan. 28, 2017. Even the forecast for rain Thursday in the Bangor area hasn’t dampened the enthusiasm of Kurt Gagne and Jenn Khavari. They are two of the people responsible for bringing East Coast Snocross to the Bangor area for this weekend’s racing event at Speedway 95 in Hermon. The fifth annual Dysart’s Sno-X is being held at the stock car racetrack for the second time after three years at the Bass Park harness racing track in Bangor. 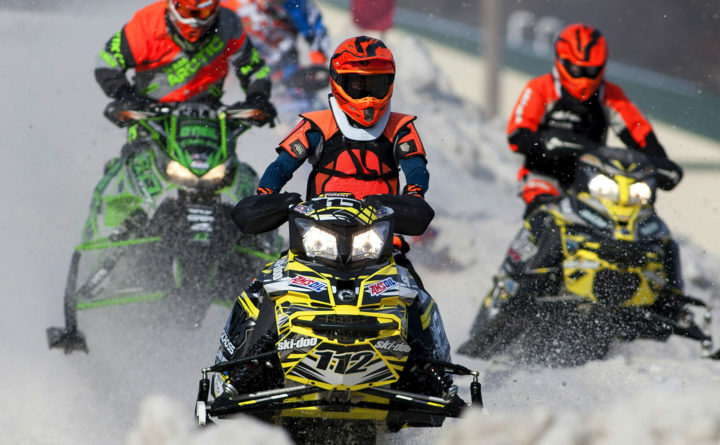 Snocross involves snowmobiles racing on a track that features steep jumps, banked corners and tight turns. There are several classes of competition. Eastern Maine Community College hosts the event that serves as the largest fundraiser for the Bangor-based school’s EMCC Foundation. The nonprofit entity raises money to benefit the students by providing scholarship money or upgrading the school’s resources. The Foundation receives a portion of the profits from East Coast Snocross, which is owned by Gagne, according to Khavari, EMCC’s director of advancement, who serves as the liaison for the event. “The rain will pack the snow down and help shape the oval. That will be in our favor,” said Khavari, who noted they have dealt with all kinds of weather challenges over the first four seasons and have learned how to adapt to them. They have even had snow deficiencies that required them bringing in snow guns used at ski mountains. But Sunday’s snowstorm was a welcome sight and snow continues to be trucked in from a variety of areas such as Bangor International Airport. “We’re going to have a pretty big track this year with all the snow they’re trucking in,” Gagne said. Khavari said one of the advantages of holding the Snocross at Speedway 95 is the fact the pit area where racers work on their snowmobiles is a setup to which they are accustomed. Gagne said the setup is a good one in other ways, too. Gagne also praised racetrack owner Del Merritt for providing East Coast Snocross with whatever it needs as it leases the track from Merritt. Khavari said approximately 3,000 race fans attended the event last year. “That was a great turnout despite moving the venue,” Khavari said. One of the top drawing events was the Darling’s Trail Class race for recreational snowmobilers whose sleds are not modified for racing. “We hadn’t done a great job advertising it before but we really pushed it last year,” said Khavari, who said there were 300 competitors in the trail class last year and could have even more this time. She said that pre-registration has been overwhelming, but that racers also can register the day of the event. Gagne said anybody can participate as long as they have the right equipment. Those interested in racing can do so by registering at eastcoastsnocross.com or via email at reg@eastcoastsnowcross.com. The fee is $25 per day. “We should have a real good turnout of racers and spectators,” Gagne said. Khavari said fans should dress appropriately for the weather conditions and will be given a bracelet when they pay for admission so they can go out to their cars and warm up if needed. Gagne and Khavari said they have been fortunate to have a strong group of sponsors, including Dysart’s, Darling’s, the other sponsors include First National Bank, Blueberry Broadcasting, Bangor Savings Bank, Best Western White House Inn, Northeast Paving Company, Chase Toys, Bangor Motorsports and Speedway 95. Gates open at 10 a.m. each day and tickets are $12 per day for adults or $20 for a weekend pass. Children 7 and under are admitted free with a paying adult. VIP seating is $25 for a weekend pass, which includes preferred parking and a swag bag. Dysart’s will have food and drinks for sale and there will be a beer and cocktail tent provided by Darling’s Waterfront Pavilion. There will be a fan appreciation party at Dysart’s on Broadway in Bangor is holding a fan appreciation party from 5 to 9 p.m. Friday in the Flatbed Pub with music provided by local band OneSixtyOne.